The Portland Mercado teems with activity, as this year’s “Taste of Latinoamérica” gets underway. 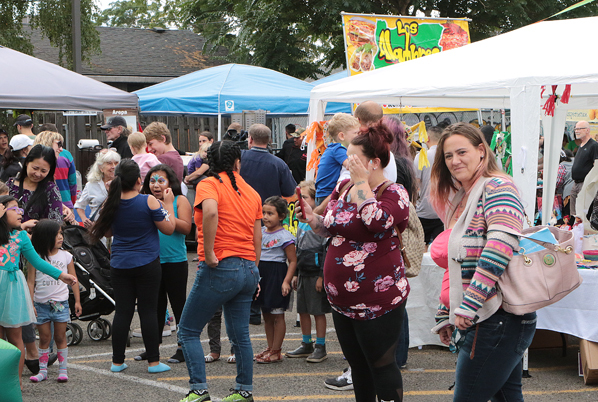 It was a grand fiesta in the Foster-Powell neighborhood along SE Foster Road on September 1, as the fourth annual “Taste of Latinoamérica” was underway at Portland Mercado. 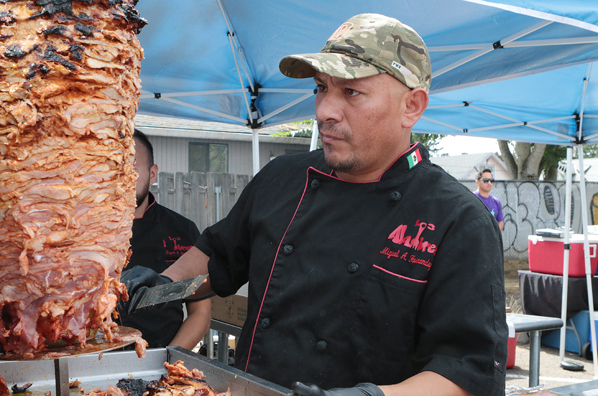 Lively Latinx music filled the air; people were taking salsa dance lessons – and of course, folks were enjoying a wide variety of food and beverages at the fiesta. 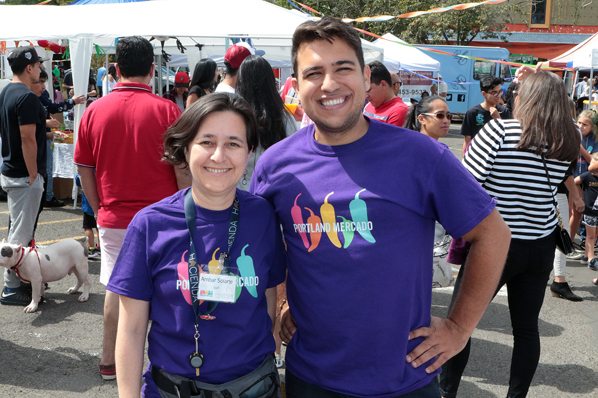 Portland Mercado Event & Marketing Coordinator Ambar Solarte ,and Mercado Director Shea Flaherty Betin, pause for a photo during the 2018 “Taste of Latinoamérica” fiesta. “Taste of Latinoamérica is our big annual celebration, featuring more than 20 vendors; we have booths representing the cultures of Peru, Guatemala, El Salvador, Venezuela and Mexico – it’s a big party!” beamed Portland Mercado Event & Marketing Coordinator Ambar Solarte. “We have many of our Hacienda CDC sponsors and partners exhibiting and helping us here today, as well,” Solarte told East Portland News. 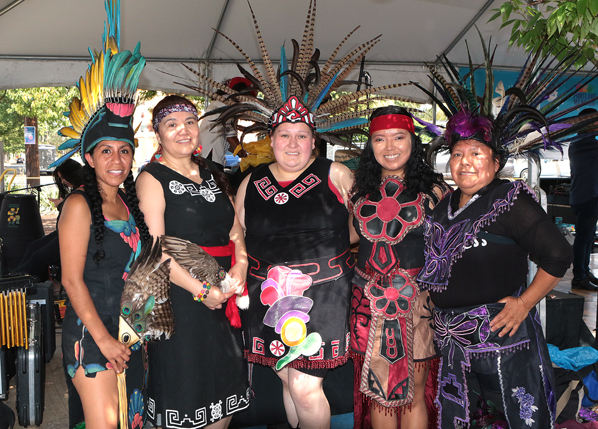 Members of the Huehca Omeyocan Aztec Dance group smile before going on stage. Visitors shopped inside the Mercado building, visited an art exhibition, saw a live letterpress printing demonstration, and took a leisurely stroll among the vendors set up in the parking lot, while their kids played nearby in a giant bouncy castle. 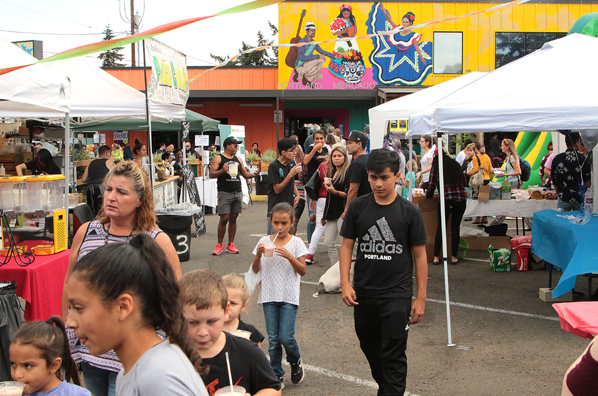 It’s important to hold the fiesta every year, Solarte said, “Because for us at the Portland Mercado, it’s a program to give everyone an opportunity to become a businessperson or an entrepreneur. Chef Miguel Hernandez of Los Alambres carves freshly roasted pork for another customer’s carnitas. “So, for many the vendors who participate at the Mercado, this is their first opportunity to have a business of their own! And, we want to close the gap between who live in the greater Portland area, and our small business partners in the Latinx community,” explained Solarte. 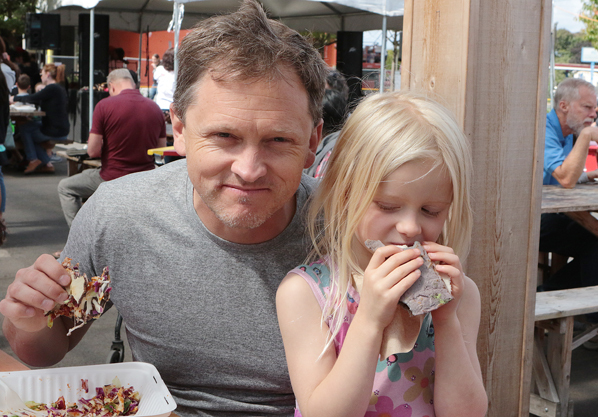 Enjoying authentic Latinx at the Portland Mercado are Kyle Lemire and his daughter Paloma. People can find out more about the Portland Mercado online at their official website: CLICK HERE. Throughout the day, the “Taste of Latinoamérica” fiesta continues.